Autoscaling is an approach to automatically scale up or down workloads based on the resource usage. Autoscaling in Kubernetes has two dimensions: the Cluster Autoscaler that deals with node scaling operations and the Horizontal Pod Autoscaler that automatically scales the number of pods in a deployment. By default the Horizontal Pod Autoscaler (HPA) can scale pods based on observed CPU utilization and memory usage. Starting with Kubernetes 1.7, an aggregation layer was introduced that allows 3rd party applications to extend the Kubernetes API by registering themselves as API add-ons. Such an add-on can implement the Custom Metrics API and enable HPA access to arbitrary metrics. One of the advantages of using a service mesh like Istio is the builtin monitoring capability. You don’t have to instrument your web apps in order to monitor the L7 traffic. The Istio telemetry service collects stats like HTTP request rate, response status codes and response duration form the Envoy sidecars that are running alongside your apps. Besides monitoring, these metrics can be used to drive autoscaling and canary deployments. What follows is a step-by-step guide on configuring HPA v2 with metrics provided by Istio Mixer. When installing Istio make sure that the telemetry service and Prometheus are enabled. If you’re using the GKE Istio add-on, you’ll have to deploy Prometheus as described here. 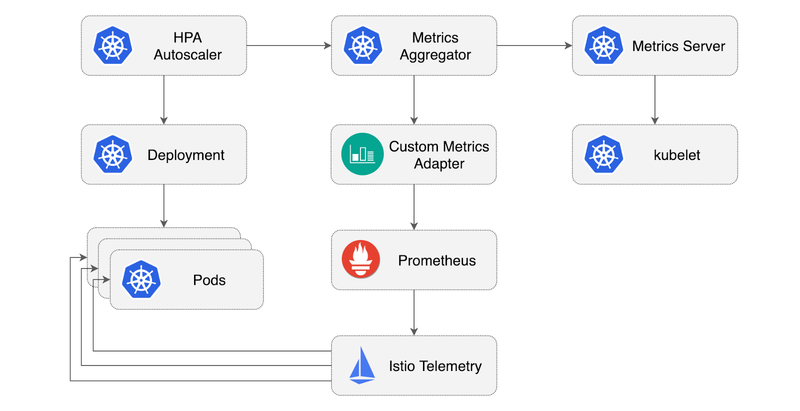 In order to use the Istio metrics together with the Horizontal Pod Autoscaler you’ll need an adapter that can run Prometheus queries. Zalando made a general purpose metrics adapter for Kubernetes called kube-metrics-adapter. The Zalando adapter scans the HPA objects, executes promql queries (specified with annotations) and stores the metrics in memory. When the adapter starts, it will generate a self-signed cert and will register itself under the custom.metrics.k8s.io group. The adapter is configured to query the Prometheus instance that’s running in the istio-system namespace. You will use podinfo, a small Golang-based web app to test the Horizontal Pod Autoscaler. The podinfo ClusterIP service exposes port 9898 under the http name. When using the http prefix, the Envoy sidecar will switch to L7 routing and the telemetry service will collect HTTP metrics. The Istio telemetry service collects metrics from the mesh and stores them in Prometheus. One such metric is istio_requests_total, with it you can determine the rate of requests per second a workload receives. The above configuration will instruct the Horizontal Pod Autoscaler to scale up the deployment when the average traffic load goes over 10 req/sec per replica. kubectl get --raw "/apis/custom.metrics.k8s.io/v1beta1" | jq . To test the HPA you can use the load tester to trigger a scale up event. When the load test finishes, the number of requests per second will drop to zero and the HPA will start to scale down the workload. Note that the HPA has a back off mechanism that prevents rapid scale up/down events, the number of replicas will go back to one after a couple of minutes. By default the metrics sync happens once every 30 seconds and scaling up/down can only happen if there was no rescaling within the last 3–5 minutes. In this way, the HPA prevents rapid execution of conflicting decisions and gives time for the Cluster Autoscaler to kick in. Scaling based on traffic is not something new to Kubernetes, an ingress controllers such as NGINX can expose Prometheus metrics for HPA. The difference in using Istio is that you can autoscale backend services as well, apps that are accessible only from inside the mesh. I’m not a big fan of embedding code in Kubernetes yaml but the Zalando metrics adapter is flexible enough to allow this kind of custom autoscaling. If you have any suggestion on improving this guide please submit an issue or PR on GitHub at stefanprodan/istio-hpa. Contributions are more than welcome!